For business owners who seek personalized guidance, I’m happy to offer one to one strategy sessions to discuss the current state of your business and identify potential for your future growth. The advice you receive will be honest, actionable, and encouraging. These strategy sessions are “private lessons” which give me the opportunity to learn more about you and your business in a one hour phone or Skype call. I really do love to talk business, which is why getting a chance to speak with a dedicated floralpreneur® in a one-on-one call is truly one of my very favorite things to do. A Strategy Session is a one to one coaching call, customized to address your specific small business concerns and answer your burning questions. Experienced designers who are at a cross-roads and need to make a big decision regarding a change in direction for their biz. Designers who have been struggling with the same uncertainties or doubts for 2 years or more. 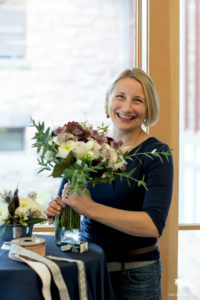 Home-studio florists who want to take fewer events and book more ideal clients. First, you shoot me an e-mail (right here: info@floralartvt.com) to inquire about availability and share with me some of your burning questions. Start by answering these preliminary questions about your biz to help prompt you. Finally, we’ll talk. I’ll take on as many of your burning questions as I can in 1 hour. We can discuss a list of action items and I’m happy to answer follow-up questions you may have. One florist ended our coaching call by saying, “I’m motivated and tickled at once.” Well, that tickled me right back. Strategy sessions are $249 for 1 hour. In return I’ll invest my time and tender loving care into your biz. and finally, I’ll provide an e-mail re-cap of our call with the action steps we discussed. Once we schedule a strategy session, you’ll receive an invoice via Paypal. Payment must be received at least 24 hours prior to our scheduled call. Results are dependent upon YOUR involvement, so I cannot offer a money-back guarantee. However, I’m confident that our session will be productive and worthwhile. If for any reason it turns out that we aren’t a good fit, or if I truly don’t feel I can be of significant service to you, I will refund 100% of your investment prior to our phone consultation. If I can point you toward someone who can help you, I’ll do that also. I do my best to accommodate your schedule so I make evenings, weekends and business hours available. I’m located in Vermont so I’m on Eastern Standard Time. No matter where you are in the world, we can make it work. Sessions are limited during my wedding season, of course. Please e-mail me at info@floralartvt.com to inquire about availability. I’ve been asked by designers to be a “mentor” and while I’d like to think of myself as waaay too young to be a mentor, the truth is, after 24 years in the floral industry I am in fact, “old enough”. I’m available to chat about any questions you may have. You can certainly feel free to contact me with any preliminary questions you may have for me. I’m looking forward to the opportunity to hear from you. Need longer-term coaching & accountability? 6-month coaching programs are available to qualified florists. Coaching programs start at $1,500.